This Japanese dish literally means chicken and egg rice bowl. 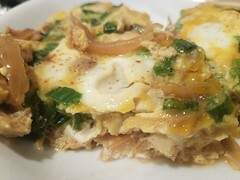 I first learned how to make oyakodon from Cooking with Dog. – After chicken is cooked, add 2/3 of the beaten eggs and stir lightly. Sometimes I add a bit of chicken broth to keep the egg mixture moist and fluffy. Cover with lid again. – Simmer for 10 seconds or until slightly set. Then add rest of beaten egg. Add green onion. I like to add a bit of cayenne pepper on top as well. Cover with lid again. – Immediately turn off stove and allow ingredients to settle and continue cooking. This dish is savory and sweet, very easy to eat!